The bowling alley management should have special accommodations for the small bowlers; little bowling balls, gutter bumpers, and easy to follow shoe or sock requirements. 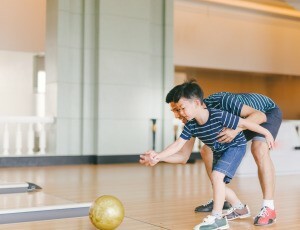 This is a guide about taking children bowling. What is the lightest weight bowling ball you can buy for a child and where would you buy it at? My 5 year old grandson went bowling for the first time with his parents and he absolutely loved it! They used the balls that were available but they were heavy for him to lift and throw. I know ZERO about bowling. He wants me to go bowling with him. So I would like to buy him his own light weight ball to use. Though I am clueless as to what the lightest weight ball I could buy for him would be or more importantly where I would buy it. I'm sure there are tons of people out there who know the answer to this bowling question and can help me. I hope so. Thanks in advance! The lightest ball is a 6lb. ball. You can purchase them online, bowling alleys or even Sports Authority and other sports stores. My children love bowling. It is great family fun for all ages! I worked at a bowling alley for 12 years. 6 pounds is the lightest. Most bowling alleys do sell bowling products and it is better to support them than some huge sporting goods chain. Besides, they are the ones who will drill it! Buying it somewhere else and then asking them to drill it would be like bringing your own food to a restaurant and asking them to cook it for you! My grandson went bowling the other day - he just loved it. He's 3 1/2 yrs old - he's very strong & tall for his age. Is 3 or 4 yrs old too young? The two big alleys new me have special accommodations for the smallest bowlers with small bowling balls, special gutter bumpers, and easy to follow shoe/sock requirements (that don't involve the yucky rentals). Talk to your alley manager and see how they can accommodate your grandson. We had a work event at this alley a few years ago and kids 2-90 had a blast! !